Viking Technology this week released its new VT-PM-series persistent memory drives that come in 2.5-inch U.2 form-factor and support hot-swapping capability. The drives are designed for applications that require a very high performance and an unlimited endurance, such as high-performance journalling and log storage for databases and filesystems. One of the key advantage of the drives when compared to regular NVDIMMs is support for hot-remove/surprise hot-add as well as an industry-standard interface. Viking’s VT-PM8 and VT-PM16 persistent memory drives use the U.2 interface operating in dual port 2x2 or single port x4 mode. The storage solutions are equipped with 8 GB and 16 GB of DDR4-2400 RAM that has a virtually unlimited endurance (well beyond that of NAND or even 3D XPoint) as well as 8 GB and 16 GB of non-volatile NAND that is used to preserve data in the event of power failure. The SSDs are outfitted with an internal supercapacitor power source that kicks off automatically when the main power is lost to transfer data from DRAM to flash using the Flush-to-Flash firmware. The drives are based on an architecture that can work with both DDR4 memory and NAND developed by Radian Memory Systems (it is unclear whether Radian uses an FPGA, or an ASIC). The architecture is fully compliant with the NVMe 1.0 command set that lets applications to access data on the VT-PM persistent memory drives via regular block or programmed I/O byte addressable access without any special requirements. To ensure data integrity, the silicon designed by Radian features a 64-bit data/8-bit ECC code to detect double bit errors and correct single bit errors in DRAM. Furthermore, the solution supports LDPC to ensure strong endurance and high performance of flash. In addition, Viking’s VT-PM drives support BIST (built-in self-test) that monitors components health and environmental status and then reports results to host systems. When it comes to performance, Viking’s VT-PM drives should be pretty fast due to a PCIe 3.0 x4 interface (supports 32 Gb/s ‘raw’ bandwidth) and usage of relatively fast DDR4 DRAM. As for power consumption, the drives need up to 13.5 W when operating as well as 17 W when recharging the supercapacitor (a process that takes 38 seconds). 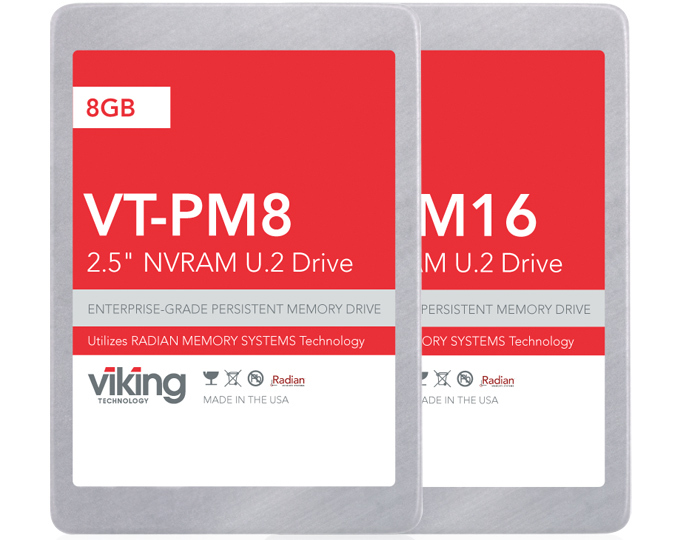 Viking’s VT-PM persistent memory drives are expected to be available shortly at prices that are up to negotiations. wonder the write endurance and the cost/capacities available, the temperature limit is not very good IMO and the wattage is similar not very good, but performance wise should be. 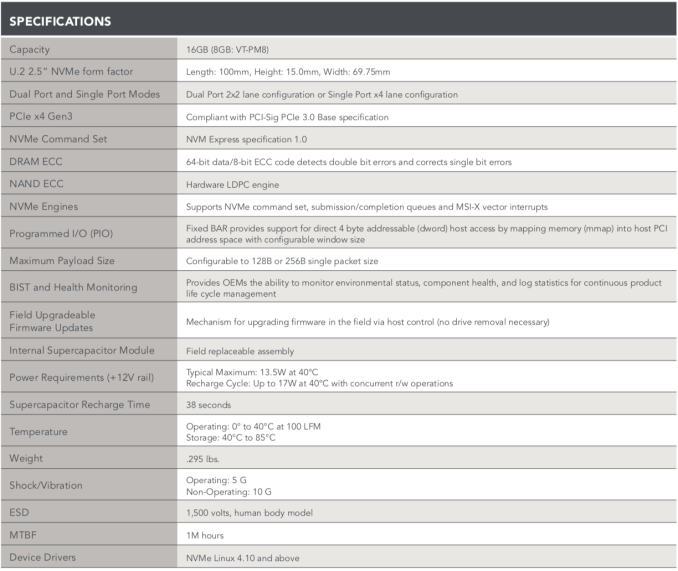 I wonder the read/write and IOPS let alone the pricing.....seems more and more ultra high performance SSD types come out but equally high $ per gb instead of finding a happy medium ground for "good enough performance and encroaching on the HDD cost per gb advantage currently enjoyed"
Not sure about Canadian prices but the 2TB Micron 1100 SATA SSD is very attractive at USD 310.